Serve with Favorite Pancakes or Applesauce French Toast. 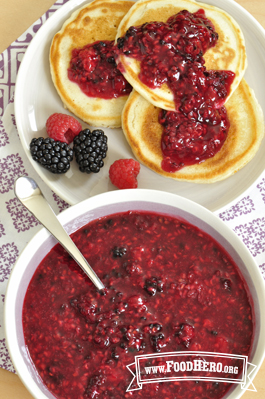 In a medium saucepan, mix together sugar, cornstarch, water, and 2 cups of berries. Mash berries if desired. Heat over medium heat, stirring frequently, until sauce starts to thicken. Remove from heat and stir in remaining berries. Mash if desired. Serve over pancakes, waffles, or yogurt. 5 Comments for "Any Berry Sauce"
My family loved this recipe with blueberries. We used this on pancakes and French toast in our house. This is easy and a fun way to spruce up pancakes for my picky eater. We will continue to make this! This is great! Have made many times with different fruits. Our favorites are all strawberries, or a mix of strawberries/blueberries. We like it warm or cold. This tastes fresher than jam/jelly from the store. SO GOOD! Only made half a recipe and still enough for leftovers. We put it on the Food Hero Gingerbread Pancakes, everyone LOVED it! http://foodhero.org/recipes/gingerbread-pancakes. Update - keep making this again and again, the kids just love it! Top it on pancakes and homeade rolled oats in the morning. We had been using blueberries, and tried strawberries today which were also amazing!